The route, which is being used by the INS Sindhurakshak, is a goldmine for Russia, as it considerably reduces transport costs and is well out of the reach of pirates. Russia has started to actively develop the Arctic Region, and the use of the Northern Sea Route could prove helpful there. The implementation of such a large-scale project is meeting Russia’s economic, political and military interests. Work to create 3 powerful nuclear-powered icebreakers that will accompany merchant ships all the way long is currently underway. To give a boost to the Russian North the road is needed in the first place, experts said at the Arctic Region Oil and Gas conference in Stavanger, Norway. The Northern Sea Route is a goldmine for Russia, and using it will be beneficial for everybody. The route makes it possible to considerably reduce transport costs. Since the route runs via Russian territory, it keeps vessels out of the reach of pirate attacks, according to Vyacheslav Ruksha, head of the RosAtomflot Agency. "First, the Northern Sea Route makes it possible to establish contacts with the Pacific and Atlantic markets as well as with powerful hydrocarbon markets, and second, the Northern Sea Route could be used to transport part of the transit mass cargoes that are transported across Africa today,” Ruksha said. “At first, in the seasonal regime, of course, and then it would be good to introduce a year-round navigation. Our new nuclear-powered LK-60 class icebreakers will be able to cut through the 3-metre thick ice shelves." Russia plans to build 3 nuclear-powered icebreakers of this class worth nearly 1 billion euros each. According to Ruksha, the first icebreaker will be built in December of 2017, and the other two - in 2019 and 2021. 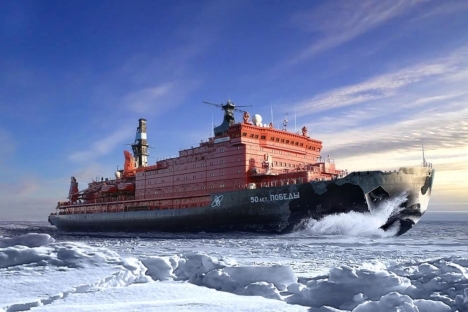 In order to develop the Northern Sea Route it is necessary not only to build icebreakers but also to create relevant infrastructure – that is, to modernize seaports and to prepare specialists who could work under the Arctic conditions, according to Anatoly Zolotukhin, Pro-Rector for International Affairs at the Gubkin Russian State University of Oil and Gas. "The climate is very unstable there, which often puts the equipment out of action,” Zolotukhin said. “As a result, a serious danger is created not only for crewmembers but also for ships. That is why there is an urgent need for using evacuation routes and for setting up relevant bases where ships could be temporarily deployed. Besides, there is a need for polar aviation that would be able to carry out the monitoring… There is also a need for specialists who could work in the Arctic Region. If we say that the Arctic oil and gas will make the backbone of Russia’s power production in the future, we should be prepared for this." The idea of the Northern Sea Route as a potential alternative to the southern routes came into being in the 16th century. In the 20th century - before the collapse of the Soviet Union – the Northern Sea Route was actively used. It’s high time now that Russia should restore this strategic route.